The Maritime Heritage Trust - Steam Tug "Kerne"
The Steam Tug Kerne is owned by the North Western Steamship Company Ltd and operated by The Steam Tug Kerne Preservation Society Limited. The Society was set up as a Charity in 2008 in order to promote the preservation and maintenance of this historic vessel and in so doing, provide a means of education into the development, operation and historic use of steam, particularly in maritime applications. It is therefore the aim of the society to maintain the vessel in a working condition and available for public viewing around the waters of the North West of England. 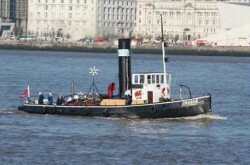 When not attending a show, or out on a cruise, she can usually be found berthed at the Maritime Museum in Liverpool, The Boat Museum at Ellesmere Port and elsewhere on Mersey Waters. She is cuurently berthed at Canning Halftide Dock adjacent to Liverpool Maritime Museum.